On Thursday afternoon I was picked up by my friend F, and my short break from work began. I had asked my boss for an unusual couple of free days, during the weekend that is. Unusual since here they are the busiest. But because I let her know in advance and it was F’s birthday, she gave me the permission to do so. So we left Lignano and drove to Brescia. I got to see F’s place in Erbrusco. It’s nice, cozy and perfect for one person. F lives in an area where a lot of wine is produced and it’s surrounded by vineyards, such nice scenery. There are also a lot of hills around, covered with trees and forest, almost jungle like. He lives in a apartment building even though it consisted of only two floors. The neighbors were cute, all greeting and chatting with each other every time they met. I think in that neighborhood no secrets exist since everybody lives so close to one another and apparently follow each other’s lives. We stopped by Bergamo Thursday evening too, because I had been telling F all about my need to visit H&M. My boss didn’t tell me before I arrived that I would have to have a white collar shirt with me, so I have been wearing a let’s say alternative t-shirts under my work outfit. Until now I have also been suffering of chilliness, since it has been raining a lot here lately which the locals say is normal for spring. What I hear, it’s raining all over Italy. But for a receptionist sitting all the time, with the hotel bar doors always open, it’s not good. I wanted a pair of dark blue pants too so I wouldn’t have to always wear my skirt. Don’t get me wrong, I love skirts and everybody that knows me know that I live for wearing skirts but I don’t want to catch a cold here, so I definitely was desperately looking for a pair of pants. And since H&M is like my second home, I always find what I need there, I was extremely happy to enter the doors of the store to find everything I needed. Once again, I owe my life to H&M, hehe. We went for a late dinner in Erbrusco to a local pizzeria. I got to taste some local specialties too, like an ice cream peanut cake and pannacotta with strawberry sauce. Delicious. Erbrusco is a cute little village with typical Italian narrow roads and a beautiful church. Interesting enough, you can find a nice gate there made by a well known artist who makes usually sculptures. 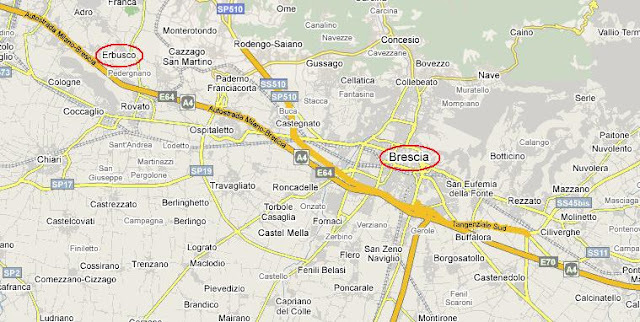 Friday morning we decided to go to Brescia. I got the best city guided tour possible from my friend who took me through the historical center with its castle from which you can see the city panorama as well as to newer sights like the city hall, and the down town district. It was wonderful to find myself again in a city full of life, with tons of Italians. Such a difference compared to small Lignano where the high season for tourism is yet to begin. We had lunch at F’s place and then decided to take the first step in order to realize my thesis. I had now finished writing my theoretical part, at least most of it, and therefore completed the questionnaire I wanted to be filled in as a part of my research. F took me to a place where they print things and make photocopies, so I left with 100 copies of my questionnaire. A truly great feeling, even though it only meant the beginning of my research. Right then and there, I also got my first respondent, the man who made the copies was kind enough to answer my questions. Later on, me and F went to another shopping center. We spent the afternoon just enjoying each other’s company, having coffee and ice cream. We tried to eat sushi for dinner, but arrived too late since I fell asleep for an hour after our afternoon shopping. By now, I have got used to drinking at least four coffees a day, so it doesn’t help me to stay awake. 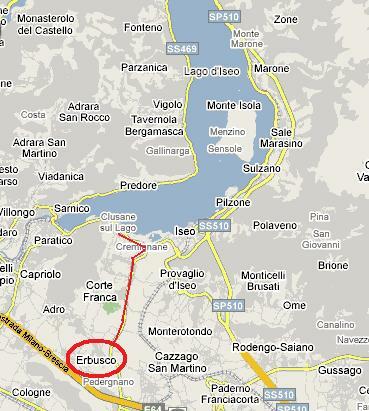 Instead we went for dinner to lake Iseo, a nice area only 10 mintues away from F’s place by car. I had a great pizza with gorgonzola and asparagus. Later we went to a near by town to a restaurant/bar called 030. One of F’s friends was working there as a deejay. The place was great. House music, dancers etc. It was basically built up so that the bar was in the center and everybody was standing around the bar. The bartenders were also entertainers, speaking on the microphone every now and again. The cocktails were strong and the music was loud. Loved. it. A cocktail there costed about 5-6 euros, not even that much. I must add though that I hate the Italian way of ordering in bars. You always have to queue first in order to pay at a cashier, and then you queue again at the bar to get the cocktail you want in exchange for your receipt. At around one thirty we headed home and watched F’s favorite movie, an Italian gangster movie called “Romanzo criminale”. Great movie. We both fell asleep on F’s couch, it was quite cute actually. At six o’clock when the movie ended, I finally managed to drag myself to F’s bed. With only four hours of sleep, we woke up at ten and went again to lake Iseo. This time for lunch. The area was beautiful. It reminded me of lake Como, which F corrected me in saying that if I would say that out loud to a local, he/she would probably kill me. So even though the lake might have seemed like lake Como to a foreigner, for the locals, it’s something completely different. The lake is surrounded by green hills but also mountains with snow. There are several small villages surrounding it, I liked that. It was a hot day, at least 25 degrees so I was wearing only a top. What a great feeling! I had the privilege of going to a local seafood restaurant with F. I got to taste the most amazing food, for sure the best I’ve had since I arrived. Despite the fact that foreigners seem to believe that Italy is only the home country of pasta and pizza, there is a wide range of other typical food here. I ate as a first dish pasta leaves, similar to lasagna leaves, with a mix of crayfish and shrimp inside. It was soooooo good. 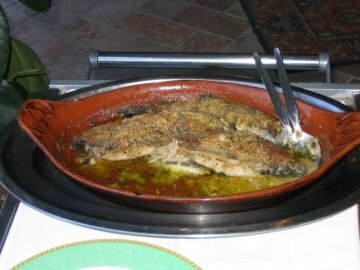 My second dish was a local specialty, a fish called tinca. It is a very greasy fish, so it is perfect winter time when it’s cold outside. Even now it was wonderful. They had prepared the fish in the oven putting bread crumbs on top of it. 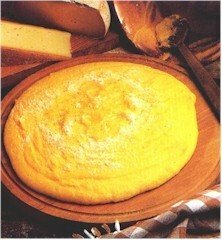 It was accompanied by polenta, the North’s similarity to pasta, made out of corn flour, something that reminds me of cuscus. I really liked everything I ate at the restaurant, and of course the sparkling wine that followed. A divine meal, if you ask me. After enjoying our time at the lake, it was time to start to head back to Lignano. The car drive took about three hours, of which I slept one in the car. F must think I’m very strange since I seem sleepy all the time. But I have noticed that for me it’s normal in Italy. Here I’m always more tired since the surroundings are more demanding for me with the foreign language and unpredictable circumstances. Once we got back to Lignano, the city was packed. I was surprised to find life here. But the 25th a local party, the flower market called Fiori a Lignano started so it brought a lot of people here. Apparently all weekends are going to be like that. My colleagues have especially warned me about next weekend, starting on Thursday because then it’s a holiday in Italy like in other countries, but here it is preferred to be spent on the beach if the weather allows it. The first of May is celebrated in a simple way; it’s merely a day for workers when many demonstrations are held in the big cities, but there is no carnival feeling as at home. I hate thinking about missing the celebrations in Finland, so I’m happy if we will have a lot of customers. Work will keep me from thinking about it more. As I mentioned before, Sunday was a busy day so I got to work some in the breakfast section in our hotel too. It was a nice experience. Mainly my work was to clear left tables, remake tables, ask customers what they wanted to drink and bring them coffee or tea, and add stuff to the buffet table. The customers were nice, so I like the experience. I also got to wash some dishes that came from the breakfast. It was refreshing to try another type of job, so I’m looking forward to helping in the kitchen also next weekend.